One of the many charms of cuisine is that it tells you so much about a place. The culture. The climate. The people. I am fascinated by how local food can be unreservedly distinctive and diverse. Even in a small country, each region can boast its own unique specialities influenced by traditions, availability of ingredients and geography. 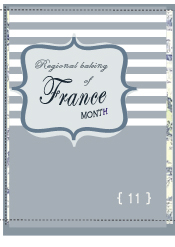 This month, I will be showcasing a small sampling of desserts distinctive to a handful of regions around France. The characteristic gastronomy of Alsace in the northeast, and the gentle blend of German and French influence. The rich dairy and farming lands of Brittany and Normandy, and the abundance of cream, crème fraiche, milk, butter and apples. The characteristic rum and spice of the port region of Bordeaux, a vestige of the trade of yesteryear. The temperate and sun-drenched climate of Provence and the orchard of citrus, fruits, herbs and nuts. I hope you will enjoy the trip around France with me.